(1926-1927) Having secured a long-term contract with Clay’s Theatres in Sydney in March 1926, Harry Ross and his partner Clara Keating staged their first revusical Count Ivanitch at the Gaiety Theatre, and thereafter toured a new show every four weeks around the company’s circuit. Presented by the Harry Ross Revue Company, most of these one act musical comedies featured the character Fluffy (played by Keating). Her first partnership was with comedian Will Gilbert (as Billo and His Little Bit of Fluff). When Gilbert left the troupe Joe Rox took his place as Rusty. After their Clay’s contract ended Keating and Ross took their Joybringers company to Rockhampton. For this engagement Keating teamed up with Ted Stanley as Tibby and Fluffy. 1: The Clay’s Theatres circuit in 1926 and 1927 saw each of its contracted troupes play a week each at the Gaiety and Princess Theatres, followed by a tour of the Sydney suburbs and several regional centres – primarily Illawarra and the Hunter Valley regions. 2: The first Rusty and Fluffy revusical was likely Christmas Spooks, which premiered at the Gaiety Theatre on 18 December 1926. (ca. 1922-1923) The comic characters Bluey and Dopey, portrayed by Nat Hanley and Harry Coyle are believed to have made their public debut on Harry Clay‘s Sydney circuit in 1922. Dopey (played by Coyle), was written into Hanley’s original revusical Cowboys and Cowgirls, with the author playing Arizona Jack. Soon afterwards Hanley conceived the character Bluey, and he and Coyle quickly established another Australian comic partnership in the vein of Stiffy and Mo (below), Ike and Morris (below) and Dinks and Oncus (below). Like Dinks and Oncus, Bluey and Dopey may only have been seen by Harry Clay’s audiences. Another known Bluey and Dopey reveusical was Demons of the Deep (1922). Chic and Bert were two characters played by Pat Hanna and Will Crawford in a series of sketches presented by Hanna’s Famous Diggers variety company in the early 1920s. After Bert Gilbert left the Famous Diggers, Pat Hanna teamed up with comedian Joe Valli to create a new sketch partnership Chic and Joe. Hanna and Valli continued to play the roles throughout the mid to late-1920s. (1920-1923) The most popular knockabout acrobatic comedy partnership ever to work for variety entrepreneur Harry Clay, Dinks and Oncus (Jack Paterson and George Wallace) came together in 1920. The act, a hit from the start, involved a knock-about style of comedy, comprising lots of falling around, impersonations of drunks, spoofs on other variety acts, and outrageous boxing displays. Paterson later formed an act with his wife Trixie Ireland that found much success in Great Britain, while Wallace went on to become one of Australia’s most popular revusical and film comedians. (1915-1924) After coming together in 1915 Bert Le Blanc (Ike) and Jake Mack (Morris) spent more than a decade working off each as the principal comedians in various troupes – notably Bert Le Blanc’s Travesty Stars (aka Who’s Who Costume Revue Entertainers). Along with Stiffy and Mo [below], Ike and Morris were Australia’s most popular wartime revusical comedy duos. Interestingly, while Le Blanc was acknowledged as both the company leader and a very fine comedian in his own right it was Mack as Morris Levi who took on the lead comic role. 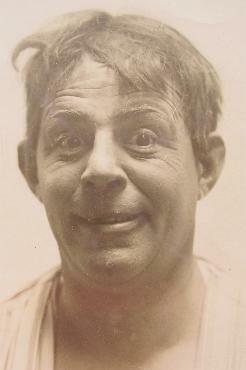 American producer/writer Al Bruce, “the hobo comedian,” came to Australasia for Fullers’ Theatres in 1918, bringing with him a number of one act musical comedies based around the exploits of a tramp character named Hank. Bruce is believed to have adapted these productions for Australian audiences right from the start, with the most immediate localisation being his stage persona’s last name – Dinkumflater. 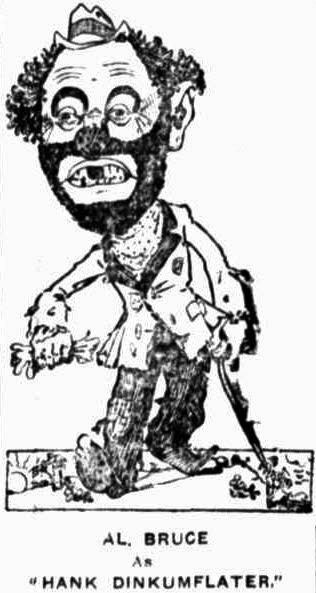 Not all the shows portrayed Hank as a tramp, however (as in The King of Patagonia, 1919,in which he is presented Happy Hank, a major’s orderly). The “Hank” shows identified to date also include The Elixir of Love, The Back to Nature Club (1918) and Two Peas in a Pod (1919). In The Elixir of Love Hank later turns out to be Duke Felix O’Shaughnessy. Image: From The Elixir of Love. Source: Daily Standard (Brisbane) 13 Dec. (1919), 2. 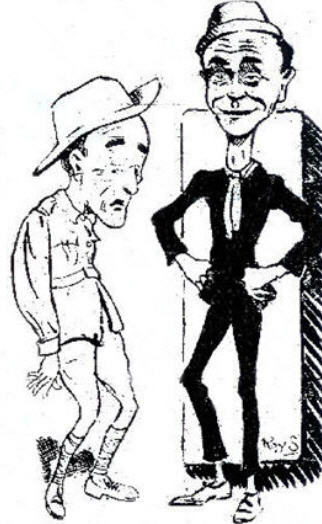 (1918) Comedians George Pagden and Will Gilbert put together a series of revusicals featuring the characters Lanky (Gilbert) and Bulky (Pagden) for Harry Clay in early 1918. In reviewing Lanky and Bulky at the Fair, the Theatre Magazine‘s critic praised Gilbert but was not so kind with his or her assessment of Pagden, who seemed to be “wasting his time.” The two men nevertheless had well-established reputations with Clay audiences. The productions were likely staged first at the Bridge Theatre, Newtown, before being taken on the road. In addition to his weekly suburban circuit Clay was also operating a fortnightly south-western circuit that included towns such as Katoomba, Bathurst, Goulburn, Wollongong, Port Kembla. To date only three works have been identified – the others being Lanky and Bulky as Farmers and Lanky and Bulky in Paris. Image source: National Advocate (Bathurst, NSW) 25 Mar. (1918), 2. Image source: Advertiser (Adelaide) 14 July (1934), 2. (1919/1922) Mutt and Chopp first appear as characters in at least one revusical staged by the Ted Tutty Vaudeville Company in early 1919 – In Tokio [sic]. Although the names of the performers have not been identified, one is likely to have been Tutty, with the other played by either Denis Carney or Eus Bronson. 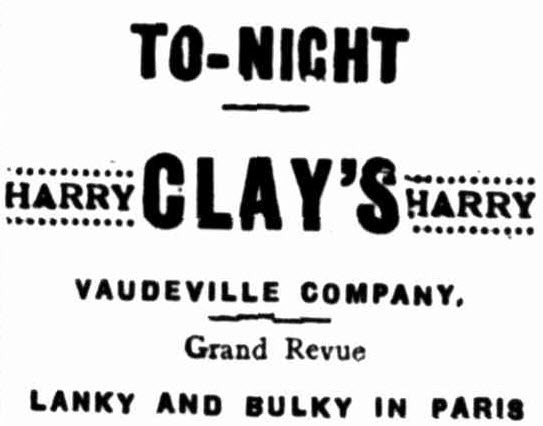 It is not until 1922 that the characters reappear on the variety stage, this time in revusicals presented by Harry Clay. In these, Bill Mutt (Harry Mansfield) and Mick Chopp (Ted Stanley) muddle their way through various predicaments (as jockeys, detectives or hospital warders etc), and in the process create much hilarity, and usually a good deal of mayhem. 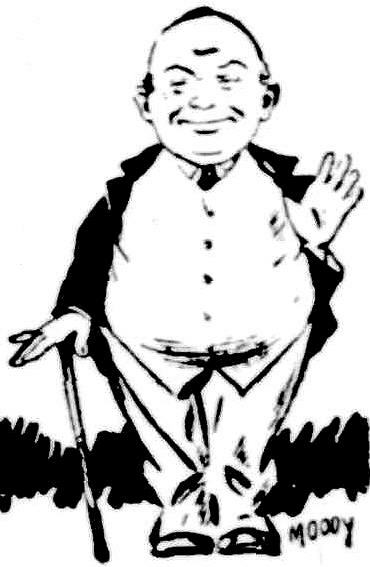 1: It is possible that Mutt and Chopp were an Australianised version or spoof of the American comic strip Mutt and Jeff (1907-). In 1911 Nestor Comedies (USA) began tuning out a weekly one-reel live-action shorts based on the two mismatched tinhorns, and in 1916 the cartoon’s creator Bud Fisher licensed Mutt and Jeff for a series of animated films. The Mutt and Jeff films were first seen by Australians in 1912. 2: The 1922 Mutt and Chopp revusicals included Nighty Night Nurse, Nell Wynne Wins, On the Beach, and The Adventures of Mutt and Chopp. These were staged during the Harry Clay Vaudeville and Revue Company’s Queensland tour (Aug-Sept) and also on the entrepreneur’s Hunter Valley circuit. Nell Wynne Wins is known to have been staged on Clay’s Sydney circuit in 1925 but no details regarding its cast or characters has yet been identified. It is therefore unknown if Mutt and Chopp were included in the storyline, and if so whether Stanley and/or Mansfield were involved. (1914-ca.1921) Paul Stanhope came to Australia in 1913 with the American Burlesque Company. After the troupe disbanded in 1914 he formed the Paul Stanhope Musical Burlesque Company, presenting a series of one act musical comedies based around the wild Irishman “Spike Murphy.” In revusicals such as This is the Life, Pardon Me (1915), Roley Poley and Dilly Dally (1917), “Spike” appeared in a variety of professions, including a piano mover and burlesque musician, sending audiences into convulsions with his quaint sayings and antics. Stanhope’s off-siders over the years included Reg Herbert, Les Bates and Charles Delavale. (1914-1932) Stiffy the Rabbitoh was an Irish-Australian larrikin developed by Nat Phillips as early as 1914. Initially appearing in a series of sketches worked up by Phillips and his wife Daisy Phillips, Stiffy represented the type of character many Australians identified with larrikinism. 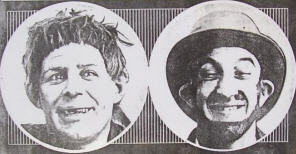 When Phillips teamed up with Roy Rene in 1916 – as Stiffy and Mo [below] – the pair played their characters with mannerisms, thoughts, and expressions that found huge support with audiences during the war years. Phillips later presented Stiffy opposite Jack Kellaway (‘Erb), Joe Lawman (Joe), Syd Beck (Syd) and Stan Foley (Stud). 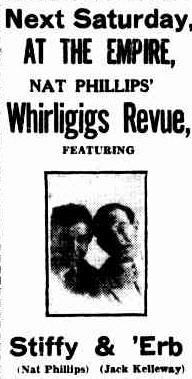 (1925-27, 1928-29) Following his split with Roy ‘Mo’ Rene in 1925, Nat Phillips put together the Whirligigs Revue Company and formed a new onstage partnership with Jack Kellaway as Stiffy and ‘Erb. The troupe presented mostly old Stiffy and Mo revusicals, with a few new works inserted into the repertoire. 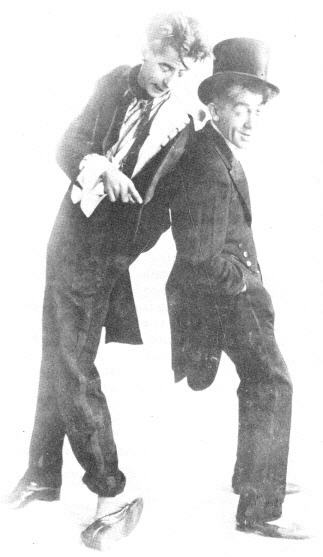 Stiffy and ‘Erb would also appear in one or more sketches staged during each evening’s first half vaudeville programme, with other members of the company performing the usual fare of songs, dances and specialty acts. For more details see Nat Phillips’ Whirligigs. (1931-32) In early 1931 Nat Phillips teamed up with Joe Lawman as Stiffy and Joe. A little over a month later the pair became a trio when they were joined by Syd Beck. Although the shows were later billed as being staged by Nat Phillips and Syd Beck’s Snapshots Revue Company, Lawman was still with the troupe and working in partnership with the other two. After Beck departed in early 1932, Phillips and Lawman (along with Stan Foley) continued working together as members of the Follies of 1932. 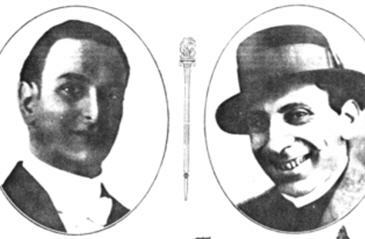 (1916-1928) One of the most popular and influential comedy duos in Australian entertainment history, Stiffy and Mo (Nat Phillips and Roy Rene) were the first truly urban Australian larrikin characters to be developed on the variety stage. The pair toured for Fullers’ Theatres between 1916 and 1925 appearing in a series of revusicals and pantomimes written by Phillips. After an 18 month break they reunited in 1927 and played their final shows in December 1928. Phillips’ death in 1932 ended their plan to reunite that year. (1930) Following the departure of Jack Kellaway (‘Erb) from Nat Phillips’ Whirligigs, Stan “Stud” Foley joined the troupe. As with Stiffy and Mo, and Stiffy and ‘Erb, this partnership also appears to have operated with the two comedians playing for laughs as opposed to the comic/straightman format. Foley remained with Phillips until late 1930. Early the following year Phillips teamed up with Joe Lawman, and later with Syd Beck (as Stiffy, Joe and Syd).